A bull gored a man to death on Friday as he took part in the traditional Running of the Bulls fiesta in the Spanish city of Pamplona, regional government authorities said. 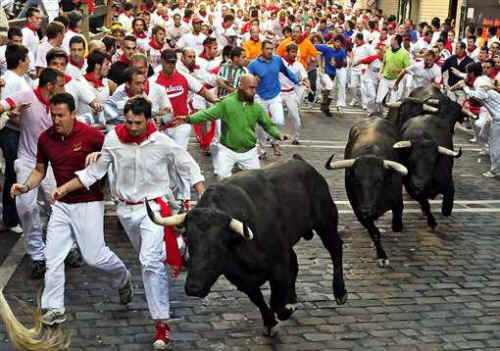 Daniel Jimeno, a 27 year-old Spaniard, was gored in the neck after one of the bulls veered into a group of runners, a Navarre regional government official told reporters. 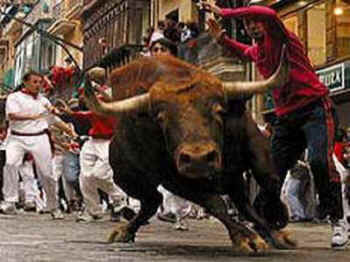 Television showed a bull flipping a man dressed in white trousers and a green shirt and then goring him as he lay curled on the ground while fellow runners tried to distract the animal by pulling on its tail and hitting it with sticks. Another three runners were injured. The death was the first for several years in the event made famous by Ernest Hemingway's novel The Sun Also Rises. Hundreds of runners from around the world now participate in the week-long fiesta, often drinking all night before the early morning run through the streets in front of bulls rushing to the bull ring. (Reporting by Inmaculada Sanz; writing by Jason Webb; Editing by Matthew Jones). For more information about ending the Running of the Bulls and to end bullfighting, visit Fight Against Animal Cruelty in Europe (FAACE).